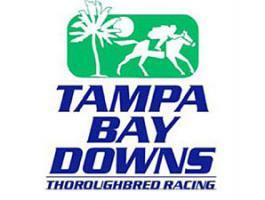 Tampa Bay Downs is located in Oldsmar, Florida, running a thoroughbred meeting from December until May each year. The track is known for large fields in both dirt and turf races, and in 2012 was ranked second among all tracks by the Horseplayers Association of America, behind only Keeneland in the rankings. The racetrack opened in 1928, and added a turf course in 1998. The track has been known by several names including Tampa Downs, Florida Downs and Sunshine Park, with its current name adopted in 1986. There are seven graded stakes run, with the marquee event of the meeting being the Grade 2 Tampa Bay Derby, a key prep for the Kentucky Derby. Trainer Carl Nafzger put the race on the map in 2007, bringing the Breeders’ Cup Juvenile champion Street Sense to Oldsmar. The colt won the race and went on to become the first colt in history to win both the Breeders’ Cup Juvenile and Kentucky Derby. Trainer Todd Pletcher is the only conditioner to saddle two winners of the race. He won with Limehouse in 2004 (who ran fourth in the Kentucky Derby) and in 2012 won the race with Verrazano. Pletcher’s Super Saver checked in third in the 2010 running of the Tampa Bay Derby, and after running second in the Grade 1 Arkansas Derby became the second runner to use Oldsmar as a prep for winning the Run for the Roses. Daniel Centeno won the jockey title four straight years from the 2006-2007 meeting to the 2009-2010 meet and has the all-time record of 144 wins at a single meeting in 2007-2008. Leandro R. Goncalves was the leading rider at the 2011-2012 meeting with 88 wins. Trainer Jamie Ness set an all-time record with 79 wins in 2011-2012, his sixth straight trainer’s title. He shared top honors with Kathleen O’Connell in 2009-2010 and with Gerald Bennett in 2010-2011.